· Standing or fixed block or blocks · Moving or traveling block or blocks attached to the load · Wire rope rove between the sheaves of the fixed and moving blocks. The purchase multiplies force (gains an advantage) because each part of the rope at the traveling block exerts the same tension on the block. The total force on the traveling block is the sum of the forces exerted by the individual parts of rope. The mechanical advantage of a purchase is the ratio of force generated by the purchase to the tension on the purchase rope. 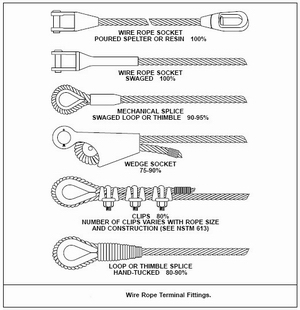 The theoretical mechanical advantage (TMA) is the number of parts of rope led to the moving block. For example, a purchase rove with 3 parts at the traveling block has a theoretical mechanical advantage of 3, and develops 15 tons of force when the rope is tensioned to 5 tons. Theoretical advantage equals the ratio of the line speed to the load speed. a. 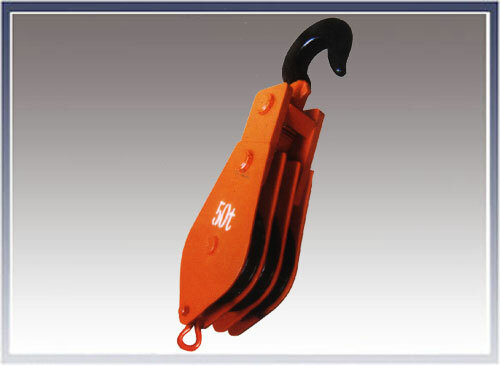 The standing block is placed in its correct operating position and connected to its deadman or anchorage. b. 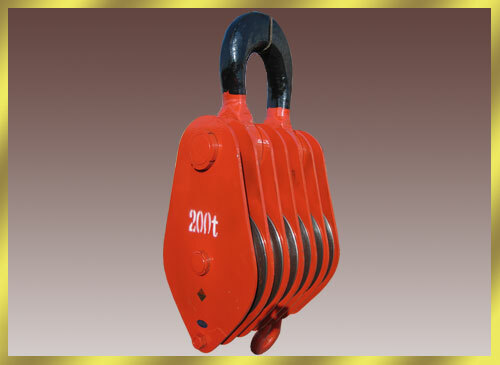 The traveling block is placed approximately two block lengths away and secured with straps shackled to a convenient strong point. c. Sheaves of purchase blocks are numbered for reeving. The sheaves of the standing block have even numbers, those of the traveling block, odd numbers. d. Each sheave of both blocks is marked clearly or painted with its number. e. A dummy reeve is made with light, synthetic, fiber line rove through the sheaves. f. After the dummy reeve is checked and approved, a wire rope is attached to the dummy reeve line and rove through the purchase. 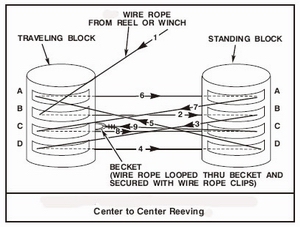 The wire serves as a gantline for reeving the main purchase wire. g. The reels with the purchase wire are set upon stools or rollers in suitable positions. Purchases may be rove after all the wire except for a short end for reeving the blocks has been spooled onto the winch drum; or, they may be rove directly from the reel. 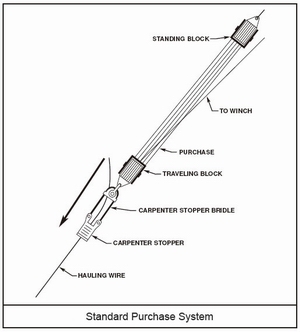 In the latter method, the traveling block is fully fleeted to its operating position, and the entire length of the purchase wire unspooled before the bitter end is taken to the winch. h. The free end of the gantline is short-spliced or welded to the bitter end of the main purchase wire. The �-inch wire is taken to power and hauled slowly through the purchase until the end of the main purchase wire emerges from the last sheave. i. The gantline is removed and the main purchase wire made up to its becket. The reeve is complete. Above illustrations show different reeving methods of four sheav blocks. The round-robin reeving system is not particularly efficient because the purchase develops a twisting moment that capsizes the traveling block. 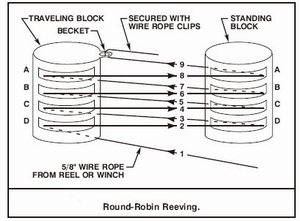 Roundrobin reeving is used only for large purchases have restraining systems. 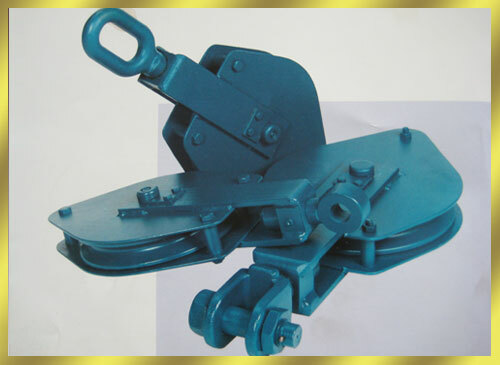 Center to center reeving is the common reeving system that has reverse bends to counter the torque that twists the purchase and capsizes the traveling blocks. 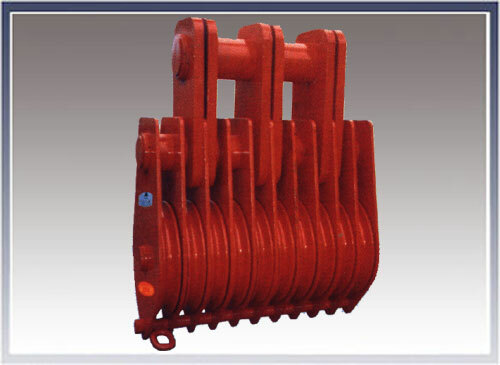 Stronger blocks up to 500 T are available.